A handful of salt solved the problem! Many times that I have shared about salt treatment with fellow goldfish hobbyists, that it would be better to document it here for easier reference. Please note that this article pertains to goldfish only. You should consult relevant information about salt concentration and treatment for other ornamental fishes. Salt (sodium chloride) is a cheap and effective first-line combat against many parasites. The correct concentration of salt is very crucial: too little would be ineffective and too much may kill your goldfish together with the parasites. It should be noted that some parasites may be resilient to salt and that salt is also not a remedy for fungal or bacteria infection. Salt should not be used as a long term water conditioner - Do we take paracetamol everyday even if we do not have a headache? ~ 2% salt dip (20 grams of salt per litre) - used for short (a.k.a 'shock') dip to kill microscopic parasites like gill and body flukes. 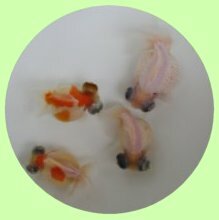 ~ 0.5% salt treatment (5 grams of salt per litre) - used for short term acclimatizing and treatment of goldfish during quarantine stage. - using a kitchen scale, 0.5% salt is 5 grams/litre and 2% salt is 20 grams/litre. - an easy and accurate way to measure salinity is using the optical instrument known as the refractometer. - sample 3 drops of water onto the optical surface and close the lead. Look through the eye piece against a light source to see the readings. 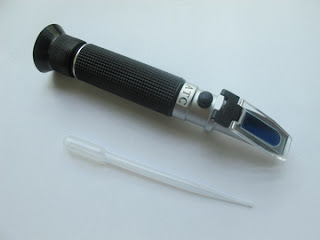 - Depending on the model of the refractometer. Use the ‰ (or per-mille) scale on the right hand side and refer to the following picture for readings on 0.5% and 2% salinity highlighted in red. - Please note that 1‰ = 0.1% and read accompanying instructions of the refractometer for proper usage and calibration. In goldfish, a very common parasite is the gill flukes (microscopic parasites) and most of them could be eradicated with a few cycles of 2% salt dip followed by 0.5% salt treatment. 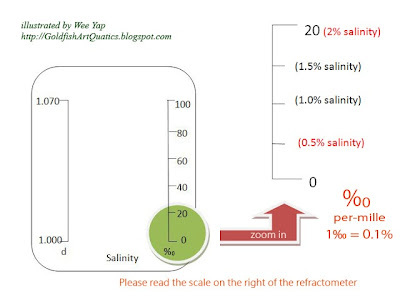 The 0.5% salinity is a very important concentration use in therapeutic treatment because the blood salinity of many vertebrates are close to 0.5%. Incidentally, salt soothes the goldfish by improving gill functions and reducing osmotic pressure. It also aides in the healing of wounds and induces a healthy slime coating. In this concentration, besides calming the fishes, it is effective against the eggs and further propagation of many parasites. As salt is rather inert against most other commercial medications, it can be safely added to most anti-bacterial and anti-fungal medications. The best practice when using salt concurrently with another drug is to consult expert advises or documentation first (for example, it is widely believed that salt should never be used together with formalin or potassium permanganate, mainly due to the dyhyrating/oxidising properties of these drugs which deplete the already reduced dissolved oxygen in salt treated water). When introducing new goldfish to your current collection, even if the new fishes are fully quarantined, extreme caution must be observed to acclimatize the 2 groups together. This is because goldfish from different tanks/ponds are hosts to their residential pathogens found in their habitats. Crossed contamination when they are mixed together triggered an onslaught of new pathogens that their body immune system may not be prepared to counter react. The story of how an introduction of new fishes managed to wiped out the whole community in days is all too familiar. In many cases, either the existing community or the new fishes survived, depending on which pathogen is "stronger". Just like the common flu bug that is always present in healthy humans, healthy fishes would still be hosting some pathogens. These pathogens exist in equilibrium with the immune system of the host body. Paradoxically, it keeps the fishes healthy by having a busy and active immune system. However, an outbreak can be triggered when the host is excessively stressed or weakened due to external factors, like poor water quality or the introduction of new fishes. The objective of a proper fish mixing regime aims to eradicate as much of these flukes and weaken their effects so that both communities of fishes can gradually acclimatize to each others' presence. If the goldfish is reasonably big and that you are confident, gently ply open its gill plate a little to look at its gills. The gills should be blood red and that the gill filaments are full and healthy, not dull red, pink or whitish. Those with pink or dull coloured gills should be treated with anti-bacteria gill medications. 1) Change 80% to 90% of the water in the pond/tank and add in new dechlorinated water. 2) Use rock salt (please do not use the table salt) to dose the tank with 0.5% salinity (make sure all the salt are melted before taking the readings). 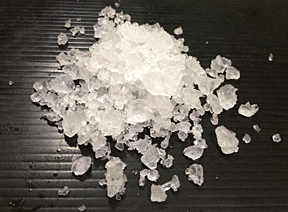 3) Prepare a small container of dechlorinated water with 2% salt solution. If the container is big, you may perform the salt dip for more fishes at the same time, otherwise, you can do it one at a time. 4) Dip all the new and current fishes in your collection that you wish to mix together in the small container of 2% salinity solution from 3 to 5 minutes. The fishes will struggle and may even float sideways and grasp for air. If you are new to this and not so confident yet, you may perform shorter dips in a few intervals. 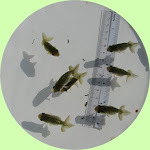 5) Take out the fish and let them recuperate in a small bowl of clean dechlorinated water for 5 minutes and than transfer it back to their habitat pond/tank that was previously dosed with 0.5% salinity. 6) In this period, do very light feeding and monitor that all the fishes are active. If a water change is needed, re-dose the new water to 0.5% salinity. 7) Repeat steps 4) to 6) on the 4th day, 8th day and 12th day to rid of the adult and larvae flukes that hatch approximately every 3 to 4 days. Welcome to my goldfish blog! 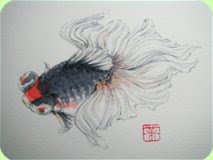 My name is Wee Yap and I am an avid goldfish hobbyist from Singapore. Come on in to Goldfish Artquatics where I will share my diary of goldfish adventures. 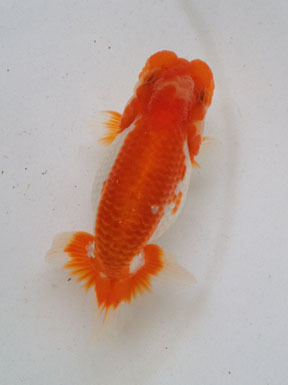 Feel my passion in my artwork and follow my journey to breed the Japanese Top View Ranchu and my dream to create a all-new goldfish variety! Breeding and maintaining a bloodline of the Japanese TVR since 2003. Marriage of 2 of my passions - Goldfish and Art. 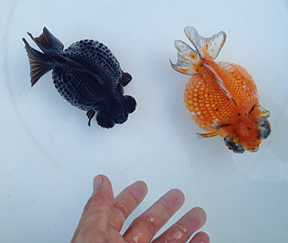 My dream of creating a new variety of goldfish in 2006 has proven to be more than just an impulsive fantasy.